I wake up in Portland city’s confines early in the morning and not surprisingly, it’s raining. The weather doesn’t deter my good mood, because today I’m going to explore the Columbia River Gorge National Recreation area. Nothing makes moss look a little greener than a light mist in the air. The day starts with a walk around Laurelhurst Park in an ironically named part of the city for such an overcast day, Sunnyside. My couchsurfing host Tom and his shepherd dog Sadie are enjoying an off leash walk while I meander around the lake snapping pictures of ducks and flowers. The park is painfully beautiful, green and lush. It’s hard to hate the cold in the late winter air and the precipitation when you see how enchanted a simple tree can look in the temperate rain forest. My travel companion for the day and good friend Jeff lives in Vancouver, Washington, just over the Oregon border. He picks me up and we’re off. This is my first visit to the Pacific Northwest and I’m charmed at the scenery. Because of Oregon’s geographic location, snow, especially near Portland rarely falls. This day in March, the peaks of the gorge are dusted lightly with snow, making for a dramatic contrast to the gray sky. 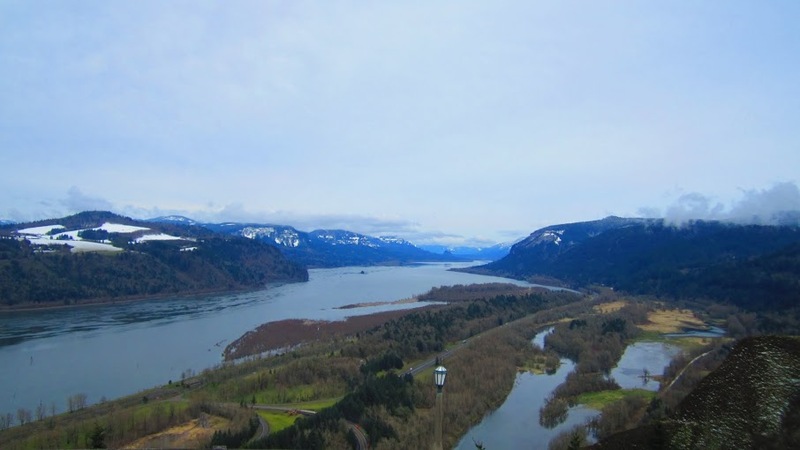 Our first stop heading east of the Columbia River Highway is Chanticleer Point which gives us our first vista of the gorge including the iconic Crown Point. I pause to read about the gorge’s geological history and learn that molten basalt from cracks near the Idaho border shifted the Columbia River Gorge north to its current location. Due to some melting ice dams in Montana during the last Ice Age, water surged over the top of Crown Point, cutting through layers of stone quickly, thus creating the greatest concentration of high waterfalls in North America. This particularly piqued my interest. Not only was this initial vista impressive, but there were endless waterfalls along our drive to discover. Not a shabby afternoon for a girl from the flat Midwest. We drive further and enter Guy W. Talbot State Park and I’m astounded by the sheer height of the surrounding trees. Because of the lush landscape, I am immediately reminded of fairy tales of my youth, half-expecting a fairy to grace us with its presence. This place is amazing. After parking, we follow the paved path from the park for a short quarter-mile hike down to Latourell Falls, sometimes referred to as the lower falls. We access it after crossing a bridge which dates back to 1914 and was constructed with special lightweight materials because of the unstable, wet soil. 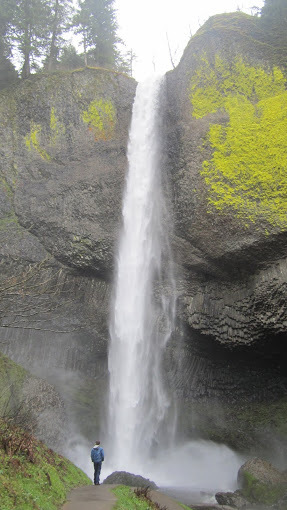 As we approach Latourell Falls, the mist from the falling water graces my face and gives me a chill. I’m not slighted or annoyed, but rather, exhilarated. The waterfall is pounding with an intensity I can only harvest respect for. I inch my way toward it, being careful to watch my step over the slippery rock. I finally get close enough to feel the earth rumbling beneath my feet and its power rocks me to my core. We get back in the car and drive down the winding, old highway bursting with basalt lava flows, giant ferns and amazing twists, turns and curves. I love this drive; it’s nothing short of magical. 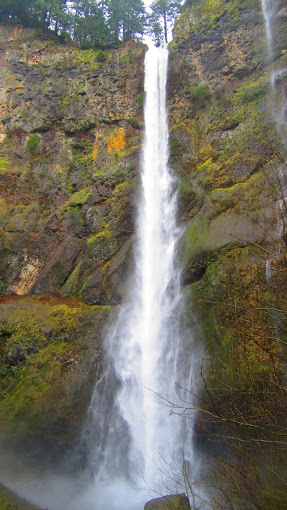 Jeff and I continue onward to the double-tiered Multnomah Falls, Oregon’s tallest fall at 620 feet. Sourced from the underground Larch Mountain springs, it’s good to visit year-round. It doesn’t dry up in the summer like many other waterfalls. A gaggle of tourists funnel up and around Benson Footbridge which allows for a bird’s eye view of the lower cascade. The bridge was built in 1914 by Simon Benson who also was one of the original builders of the old Columbia Highway. I take a moment to look out at the entirety of the gorge from the bridge. The colors are stunning and ethereal; the way the sun refracts on the gorge wall makes the hues vivid and impressive. I can hardly believe that where I stand is place of natural beauty. It almost seems like a scene I might have conjured up in a dream. 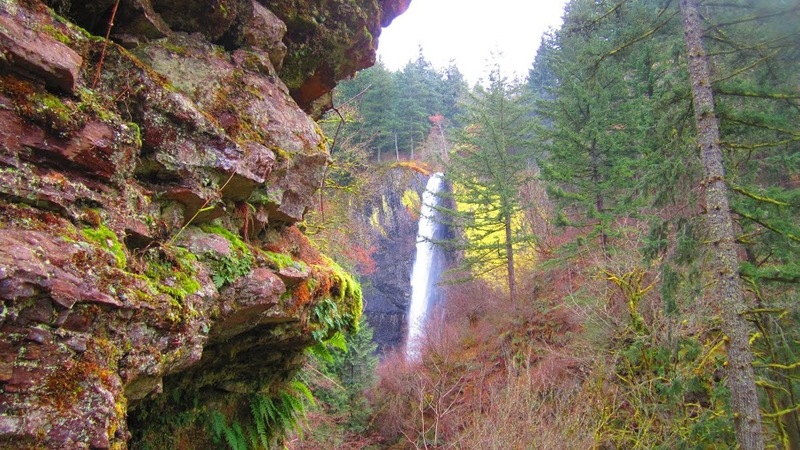 All of the sights in the gorge are just a short 30 minute drive outside of Portland city proper, each stop along the way demanding proper attention. 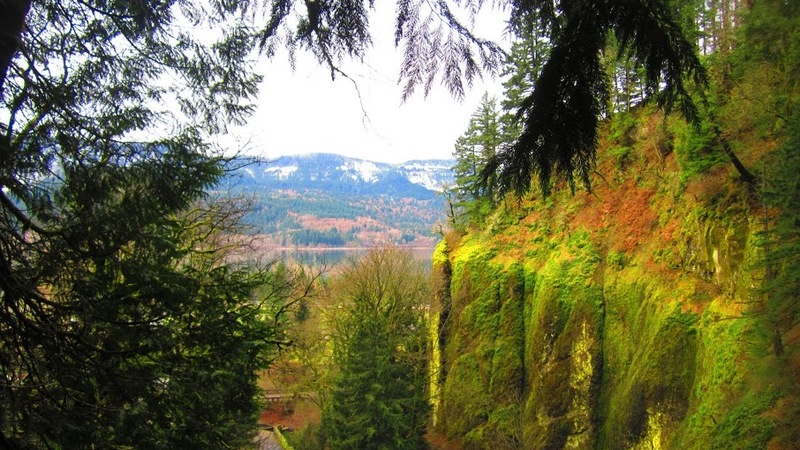 Whether it was a short hike, a photo shoot or a stroll around to gain different perspectives of the forest, the Columbia River Gorge is a great place to visit any time of year. On the ride back to the city, Jeff and I talked at length about the Pacific Northwest and its unique geographic location. 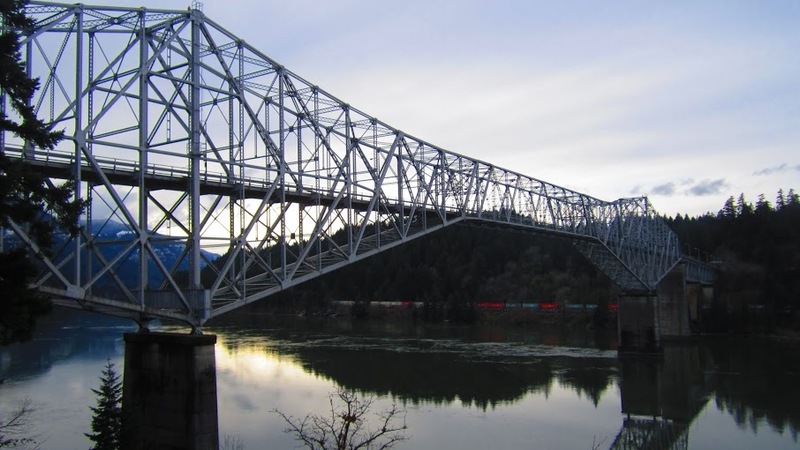 We pull off at Cascade Locks and check out the Bridge of the Gods which spans between Oregon and Washington State. The scene is romantic: A light fog mists the air as we walk the grassy park near the water. Suddenly the Union Pacific rolls by and blasts its harsh horn into the twilight. It’s chilly, damp, austere. The sun begins to set and the scene is warm, the trees evergreen. 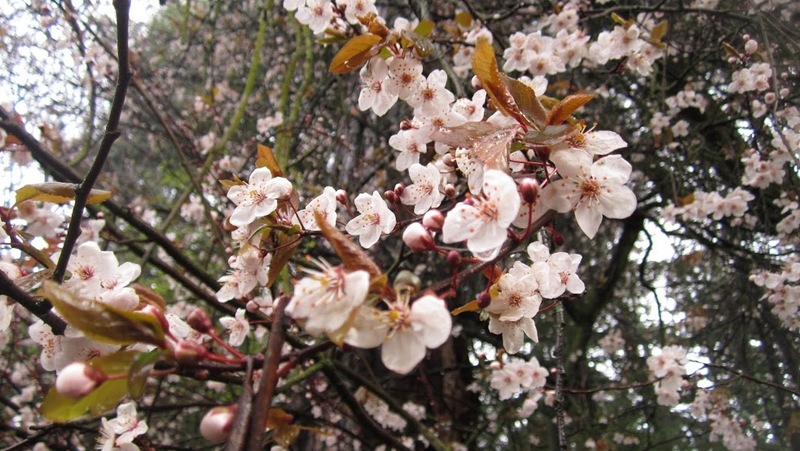 The Pacific Northwest in late winter is melting, renewing itself for a new day and season. Next postMy crazy-awesome adventurous life! Great post! I just visited the gorge on a side trip from Portland in August and totally fell in love with the place. So many amazing waterfalls and hikes! Thanks! I love it there. I think the Pacific Northwest is very magical with all of the old growth and waterfalls! Glad you enjoyed it! Thanks Tom! It was such an adventure!